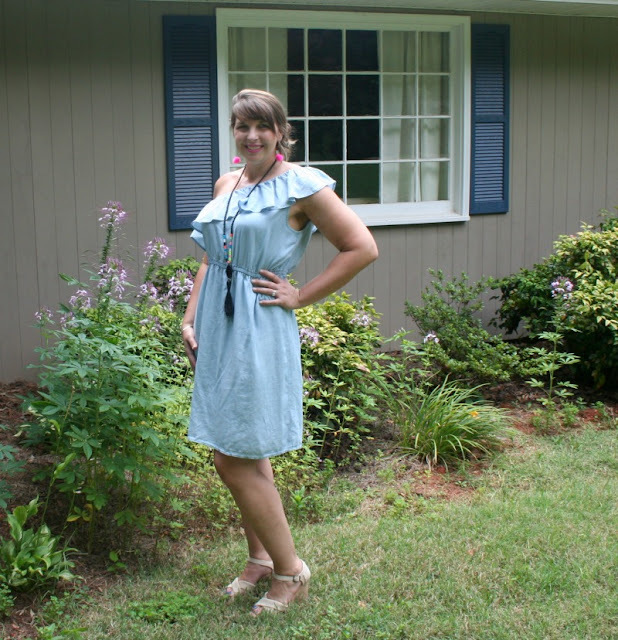 On a recent trip to Old Navy, I happened upon this One Shoulder Chambray Dress on the clearance rack for $9 and could not pass it up! I have added a couple of off the shoulder tops to my wardrobe this season, but had yet to try the one shoulder look. I am a sucker for chambray and have been looking for an affordable dress that was flattering. A few months back, I tried a chambray shirt dress on at Target, but the fit was no bueno on me. The elastic waist on this dress gives it structure, so I do not look like I am wearing a sack. This dress would be perfect for the beach with sandals or keds or you could dress it up with cute accessories and heels. I feel a little self conscious about the the side without any strap, but my friend suggested wardrobe tape, which I will be trying. I will be sharing the tutorial for the pom pom earrings soon, so make sure to subscribe to my blog so you do not miss it. 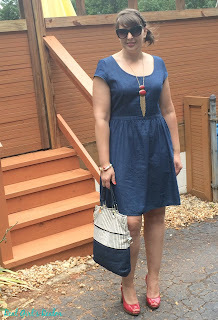 If you like this look, check out how I styled a Denim dress and an OTS white eyelet top! What a great deal on that dress! I love the one shoulder detail! This would look really cute dressed down with sneakers too. 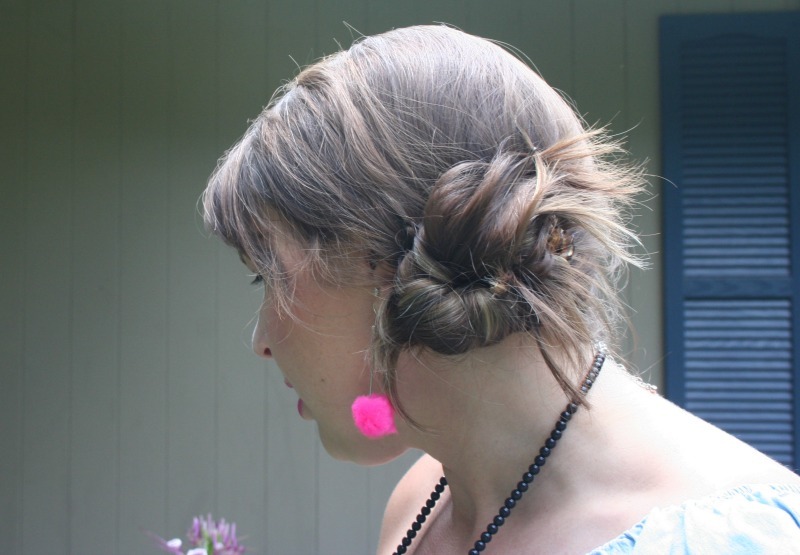 Can't wait for your pom pom earring tutorial! I like that, with the color of the dress, it can be worn with brightly colored accessories! I agree! Chambray is so versatile! Love your dress, babe! You look gorgeous! 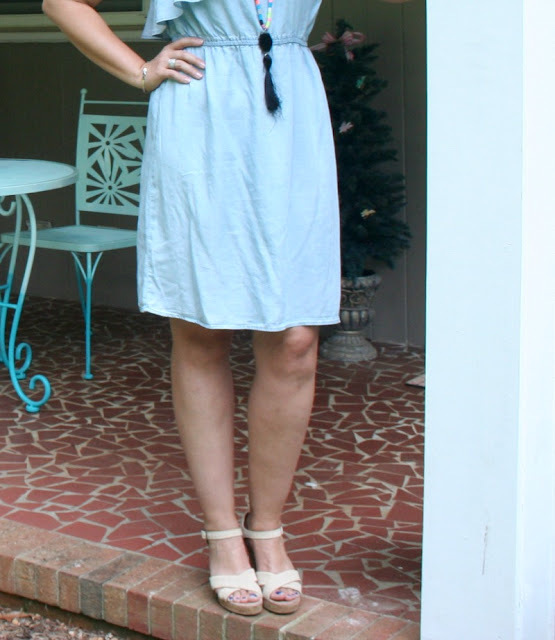 Love this gorgeous chambray dress! What a steal. 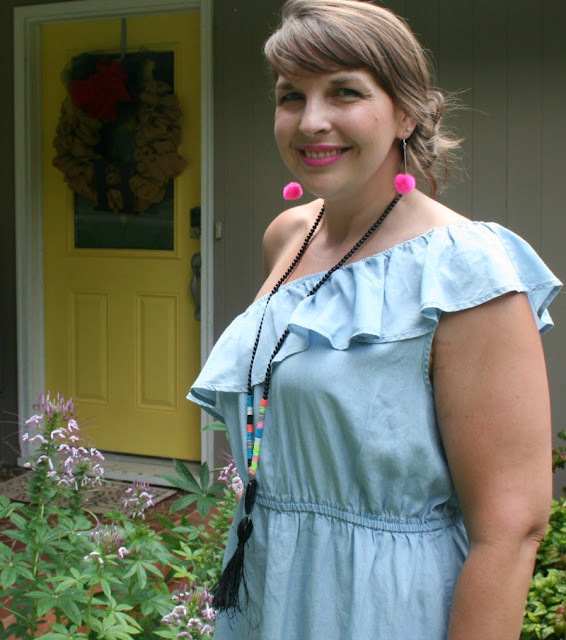 You styled it to perfection with your tassel necklace and cute earrings. Thanks for linking up with Fabulous Friday, Mary! Thanks so much Jennie! It was a great find!